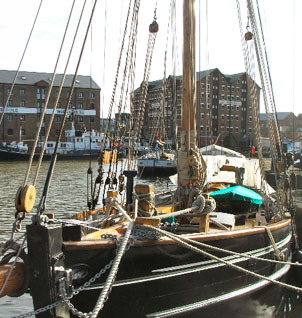 Gloucester Civic Trust has been actively involved with the preservation of the city’s unique 19th century docks since Gloucester’s decline as a working port. Over the years, members have helped to raise public awareness of the potential of the area. A Docks Group was created within the Trust in the 1970s. The group, established by Brian Tate, monitors proposals for redevelopment and aims to encourage council planners to take a sensitive approach. The Trust was represented at the public inquiry concerning the future of the North Warehouse (now Gloucester City Council headquarters). The successful outcome was a major victory and, as a result, no other warehouses were demolished. We were later instrumental in reinstalling the Atlas Bell on the North Warehouse with the assistance of the city council and the Rotary Club of Gloucester. Taken from the Atlas sailing ship, which was broken up in 1832, the bell was used to regulate start and finish times for dock workers until, in 1941, it was moved to Sheppardine on the lower reaches of the Severn to provide a navigation aid in fog. Our tour guides have offered tours of the docks every summer since 1980. We are now actively looking at ways of helping to save the future of the National Waterways Museum after being approached by the Waterways Trust. Negotiations are currently taking place. Our Trust members are also helping to improve the linkages between the Docks area and the rest of the City. View more Gloucester Civic Trust achievements, or find out more about GCT appealing against demolition of key buildings.